One thing is clear after last night's debate: Donald Trump is the rotten fruit of the American ruling class. 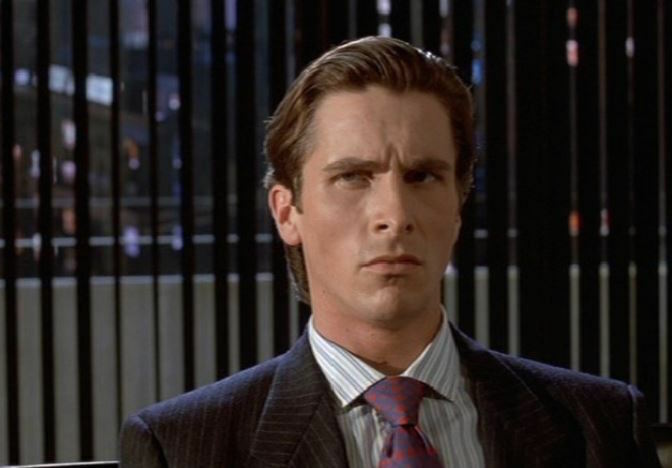 Screenshot from American Psycho (2000). After yesterday’s debate, Trump is the story again. But for all its fascination with Donald Trump, the media rarely bothers to explain the social context of his rise to prominence. After all, doing so would debunk all the posturing we see in Trump’s campaign blitz as a self-made billionaire (or as a kitsch kind of American Ubermensch) and reveal how much he is the rotten fruit of the American ruling class as a whole. However frightening or undesirable Trump may be to the establishment, he is in perfect harmony with its gross reality. Superficially, Trump has evolved with the times. He leaned towards liberalism and the Democratic Party in the ‘80s and ‘90s. Indeed, some of his political positions in the past parallel those of the Democratic Party today, since Trump used to be pro-choice, advocated a single-payer health care system and legalizing drugs, a “massive one-time 14.25 percent tax on the wealthy,” and various forms of economic nationalism (which he still does to some degree). These days Trump’s political persona is considerably more conservative; he calls for a repeal of Obamacare, criticizes immigrants for stealing American jobs, and calls for mass deportation. But throughout this metamorphosis, the core substance of Trump — his “character” as it might be called — has remained constant. What is the thread linking pre-9/11 and post-9/11 Trump’s sociopolitical make-up, and what does it tell us about the American ruling class? As Ishay Landa and others have pointed out, there is an anti-democratic and elitist nature of both liberal and authoritarian modes of politics, rooted in their shared defense of private property. Liberalism can be amorphous as a term, but in a sense it means a commitment to abstract ideas like equality and freedom, while taking for granted the economic system of capitalism. As a system predicated on class exploitation, it makes a mockery of those ideas, turning them into lifeless abstractions. Thus, in Trump’s case, this long-term transition from the Democrats to the populist Right was made possible by his unwavering commitment to the hierarchical realities of American capitalism. Even while Trump touted the sentiments of a liberal democrat, he was hell-bent on making Manhattan into his own image, trying to expropriate and ruin the lives of people through his real estate development projects. This was illustrated in Trump’s war on the tenants of Central Park South in the mid-1980s, as he endeavored to kick people out of their homes to put up more expensive real estate. This seemingly odd combination of liberal sentiments and authoritarian behaviors in pre-9/11 Trump found literary expression in one of Trump’s biggest fans: Patrick Bateman, the wealthy investment banker from Bret Easton Ellis’s novel American Psycho , set at the end of the 1980s. The parallels between Ellis’s character and the real-life Trump are apparent to some readers, and a closer look at Bateman’s obsession with Trump (or at least pre-9/11 Trump) is telling. Bateman: Come on, Bryce. There are a lot more important problems than Sri Lanka to worry about. Bateman: Well, we have to end apartheid for one. And slow down the nuclear arms race, stop terrorism, and world hunger. We have to provide food and shelter for the homeless, and oppose racial discrimination and promote civil rights, while also promoting equal rights for women. We have to encourage a return to traditional moral values. Most importantly, we have to promote general social concern and less materialism in young people. Behind Bateman’s empty calls for more equality and end to hunger lurks his pursuit of “fitting in” to a deeply stratified society. Yet how he fits in is not simply a matter of rising to the top of the economic food-chain; it’s also a matter of unleashing his bestial appetites to brutalize and kill. Both the novel and the film demonstrate how Bateman’s conformity to Reagan’s America is at one with his serial killing of the victims of Reagan’s America. We see Bateman killing homeless people and mutilating prostitutes, right after he tells his friends his concerns about world hunger and women’s rights. Behind his defense of broad abstractions lies the concrete violence these abstractions obfuscate and reinforce. Bateman towards the end confesses his crimes and is virtually ignored by everyone he admits them to. Perhaps they ignore him because all these murders are only in Bateman’s head and he really did not commit any murders; indeed, his narration can be unreliable. Or perhaps at a deeper level they ignore him because they are essentially in on the act, helping Bateman to perpetuate a social system that makes possible his gratuitous wealth and fosters his anti-social mayhem. But what does all this have to do with Trump? Trump was very much a “liberal’s liberal” before 9/11. Like Bateman, he mixed liberal notions with concrete misanthropy. From abortion rights, to gun control, to health care, Trump remained liberal, and his own business activities were able to flourish in an increasingly neoliberal economy. As the two poster-boys for 1980s wealth and greed, Bateman followed in Trump’s footsteps, even promoting Trump’s real life business book Art of the Deal to fellow characters. Trump’s book itself is a testament to vulgar success and power Bateman worships. What Trump shares with Bateman is an idealized notion of their activity as something aristocratic — as something beyond money. Bateman as a proper Ubermensch is cultured and urbane; he is not obsessed with money as much as status. When he lists copious details of different restaurants, pop-music, or details of his exercise routine, it is not done out of a sense of pure hedonism, but of out his duty to status. Money’s properties are my – the possessor’s – properties and essential powers. Thus, what I am and am capable of is by no means determined by my individuality. I am ugly, but I can buy for myself the most beautiful of women. Therefore I am not ugly, for the effect of ugliness – its deterrent power – is nullified by money. I, according to my individual characteristics, am lame, but money furnishes me with twenty-four feet. Therefore I am not lame. I am bad, dishonest, unscrupulous, stupid; but money is honored, and hence its possessor. Money is the supreme good, therefore its possessor is good. Trump’s recent “flip-flops” towards the Right today have not shifted who he is and how he has acted fundamentally. His new nativist rhetoric is geared to demographics beyond Manhattan yuppies. But even during populist diatribes that bash immigrants, Trump still likes to talk about how multicultural he is; how he loves “the Mexicans” and “the Chinese”; how he loves and cherishes “women,” and wants to take care of veterans and American workers. He invokes these lifeless abstractions simultaneously with his plans to deport millions of human beings, destroy women’s reproductive rights, and start new wars that will help to maim and kill many more. Trump is no aberration from the mainstream, even with his new home in the Republican Party. The current Obama administration has deported more immigrants than any other administration in American history, and, whatever mainstream candidates get elected, US war-making is unlikely to end. But even more than policies, Trump’s wealth is itself the product of the gross inequalities and stratified society both Democrats and Republicans have helped to maintain and reinforce decade to decade, while Trump has returned the favor to both Democratic and Republican politicians with his donations. Behind all the abstractions of multiculturalism and equal opportunity is the very real process of capital accumulation. This process of accumulation is not without its strategies of dispossession and exploitation. These strategies help to marginalize and oppress entire sets of people, whether they are the homeless and destitute of Bateman’s fictional world or the minorities and immigrants of Trump’s. The real American Psycho is neither Bateman nor Trump: it’s American capitalism. One thing is clear after last night’s debate: Donald Trump is the rotten fruit of the American ruling class.